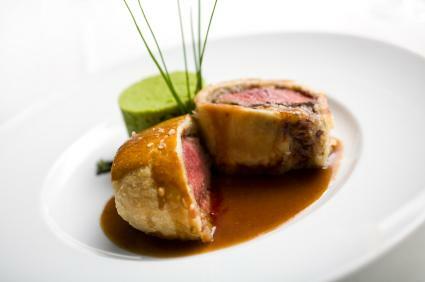 Beef Wellington ordered in a restaurant usually has a hefty price tag attached, which is based on the quality of the beef and the complexity of its preparation. By using easy Beef Wellington recipes adapted for home cooks, you can create this impressive dish while saving money, and impress your friends and family with your culinary skills. Traditional Beef Wellington includes liver pâté. Since many people have an aversion to liver, or pâté is unavailable in their local area, some recipes replace the pâté with ham or prosciutto, which adds a layer of complexity to the dish that complements the other ingredients. Place oven rack in the center position and preheat the oven to 425F degrees. Place roast on a rack in a shallow roasting pan and roast uncovered for 50 minutes or until a quick read meat thermometer registers the internal temperature at 120F degrees. Remove roast from oven and cool completely, which usually takes between 30 and 45 minutes. Heat butter in a heavy skillet over medium heat until melted. Add mushrooms and onions and sauté until the mushrooms have released all their liquid and the onions are translucent. Add the sherry and parsley to the pan and cook until all the liquid has evaporated. Roll pastry into an 18-inch by 14-inch rectangle about 1/4 inch thick. Carefully spread pâté over pastry, taking care not to tear it, leaving a two-inch border around the perimeter. Spoon the mushroom-onion mixture down the center of the pastry on top of the pâté. Place the beef, top side down, on top of the mushroom mixture. Envelope the roast with the pastry, sealing the edges with the egg wash.
Place the package seam side down on a lightly oiled baking sheet. Cut stem vents in the top of the pastry and, if desired, decorate the top with extra pieces of pastry dough. Brush the surface of the pastry with the remaining egg wash.
Roast at 425F degrees for about 30 minutes and let stand ten minutes before carving. Place a large piece of plastic wrap on the counter. Lay out four thin slices of ham or prosciutto on it to form a large rectangle. Spread the mushroom-onion mixture on top of the ham. Center the beef roast on the mixture and, using the plastic wrap as a tool, tightly wrap the beef so the ham and mushroom mixture covers all sides, twisting the ends of the wrap to secure the package. Place the wrapped beef in the refrigerator for 20 to 30 minutes. Remove the plastic wrap and proceed as directed in steps 8 and 12 through 16 in the previous recipe. The more you make Beef Wellington, the easier it gets. It makes a wonderful focal point for special dinner celebrations and will become your go-to dish when you seek to impress. A great advantage to making Beef Wellington is that it can be completely prepared for the oven several hours ahead of time and refrigerated until baking, leaving you time to relax and enjoy mingling with friends and family.